Convicted 26.05.1919 of contravention of the Betting Act 1853. Fine £20 plus 7/- costs or 2 months detention. Referenced 1674, 1691, 1750 & 1774. The Commissioners for the repair of the Pier were to meet here Monday 16th June 1750. In 1764 it was the termination point for the `Flying Coach on steel springs' run by Job Smith between Gt. Yarmouth and Norwich. ALLDAY & KERRISON announced that in pursuance of his Majesty's Proclamation, they would be at the house Wednesday 1st May 1776 to exchange deficient gold coin, coined before 5th January 1772. Guineas, Half Guineas and Quarter Guineas would be exchanged for new coins, provided they were within weight limits. John Atkinson announced 16th January 1819 that he had taken the Inn. 10th May 1823 - Mr. R McEwan thanked all for favours received and announced to the Nobility and Gentry that he had spared no pains in improving the Wrestlers Inn and Nelson's Hotel. On 20th December 1823, John Atkinson announced that he had again entered the Inn. Reduced in size during the 1800's. The WRESTLERS TAP was on the North side of Row 20 leading from Howard Street to the Market Place. 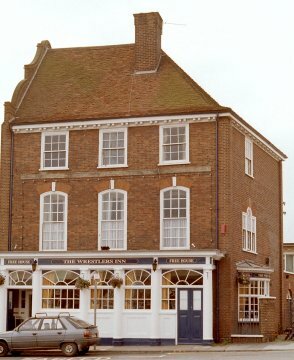 Given as the WRESTLERS TAP, Two Necked Swan Row in 1830. For Sale by Auction Wednesday 10th April 1850, described as a Freehold Property, an old-established Tavern and Liquor Shop, for many years known as the Wrestlers or Nelson Hotel. Wrestlers Plain became Brewery Plain then Church Plain. Rebuilt after 1945 following damage by enemy action 07.05.1943. Back to the WRESTLERS 1997.